We climbed to the spine of the Koʻolau Mountains to clear the stretch of the summit ridge between ʻAwaʻawaloa and Kaʻinawaʻaunui. August Smith and I rendezvoused at the top of Maunalani Heights to stage a car where we would end our hike. When then drove up to Waʻahila State Park at the top of St. Louis Heights where we would start our adventure for the day. After passing through groves of cook island pines, strawberry guava, and ironwood trees, we climbed up and down a series of small hills on Waʻahila Ridge. 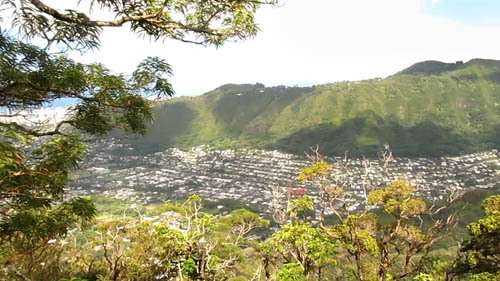 There was lots of activity on the trail — a group of hunters was returning to the park and we ran into Randy Ching and the Sierra Club who were hiking to the summit of ʻAwaʻawaloa — also known as Olympus. 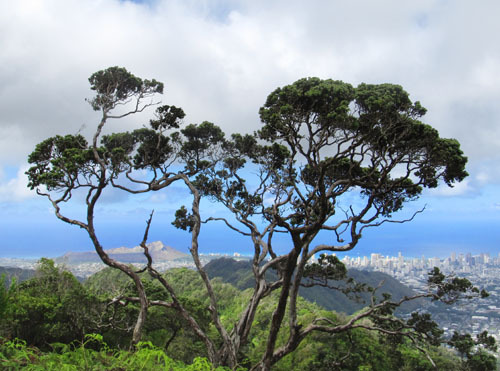 We stopped by a stand of koa trees to soak in the view of Manoa Valley and Tantalus (Puʻu ʻŌhiʻa). 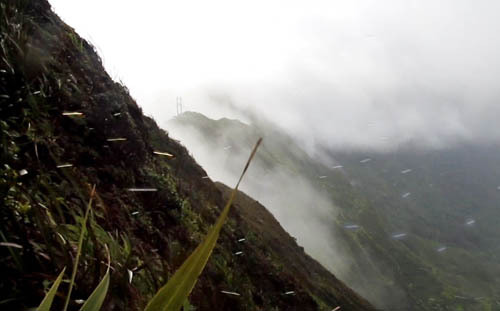 The skies over the southern coast of the island were mostly clear but the Koʻolau Mountains were shrouded in misty clouds. While making our way from one hill to the next, we came across several hunting dogs who got separated from their pack. 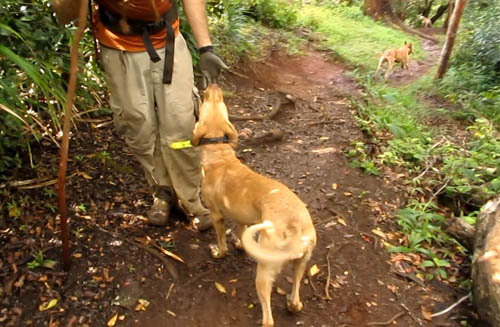 The friendly dogs followed us for a bit, but eventually went off on their way and hopefully reunited with their master. 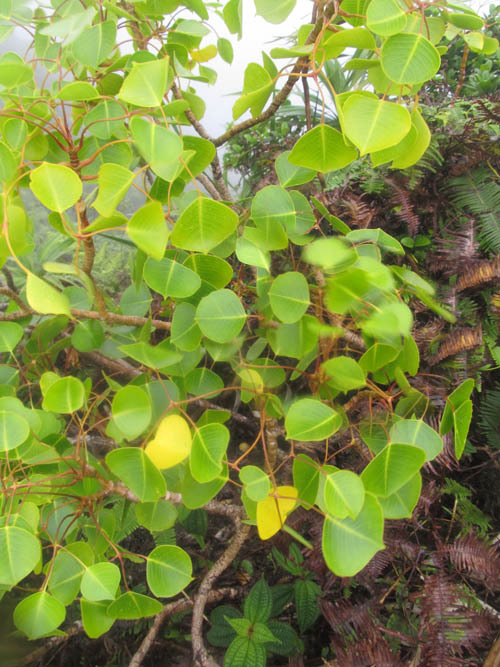 The great thing about Waʻahila Ridge is that ʻōhiʻa trees (Metrosideros polymorpha) thrive on the upper sections of ridge. We admired views of Diamond Head (Leahi), Waikiki and the southern coast of Oahu framed by the trunks and branches of ʻōhiʻa trees. 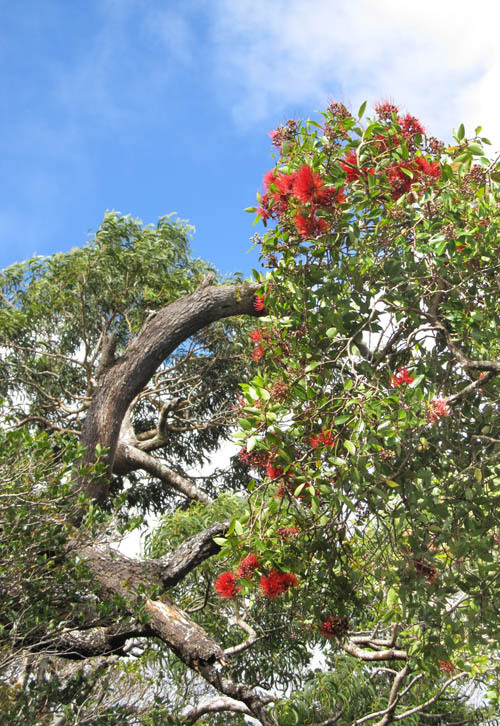 We were pleased to see a number of lehua ahihi trees (Metrosideros tremuloides) in bloom with red flowers. The branches of this ʻōhiʻa often assume a semi-weeping form with its leaves and flowers dangling from above. The higher we got on the ridge the more moss-covered ʻōhiʻa trees we encountered. We saw an unusual grouping of ʻōhiʻa and koa trees with mounds of moss growing around their collective trunks. 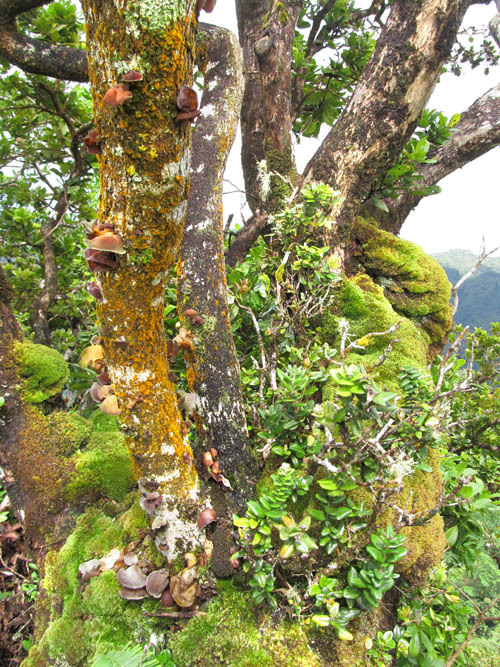 The koa tree was dead and many pepeiʻau — an edible fungi — grew on its dead limbs along with a dusty orange lichen. 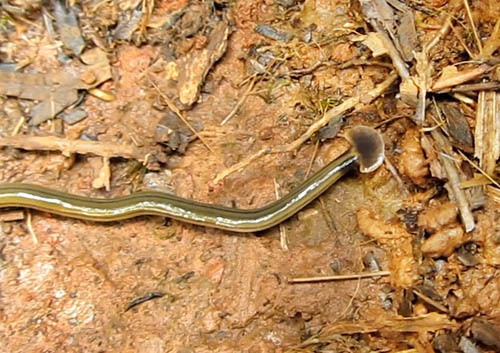 We stumbled upon a really long weird looking worm that had a shovel-shaped head! The flat worm was at least 20 inches long and had a head that reminded me of a hammerhead shark. After climbing up the slippery eroded slope we reached the summit of ʻAwaʻawaloa where uki grass (Machaerina angustifolia) thrives. 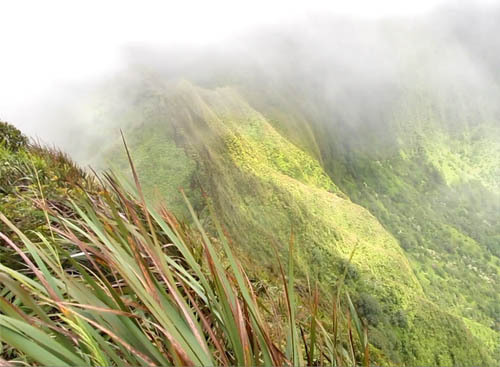 Clouds blew in and shrouded the Koʻolau summit ridge in a gentle mist. 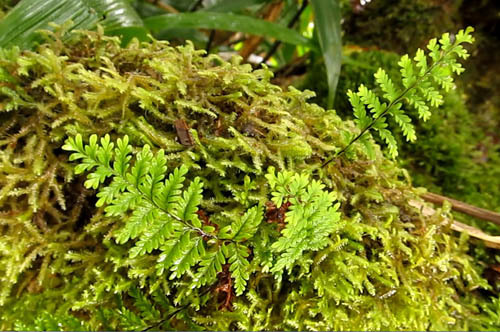 Many of the ʻōhiʻa trees along the summit ridge are covered with mosses and ferns — wahine noho mauka (Adenophorus tamariscinus) which have small fronds 2-3 inches long. 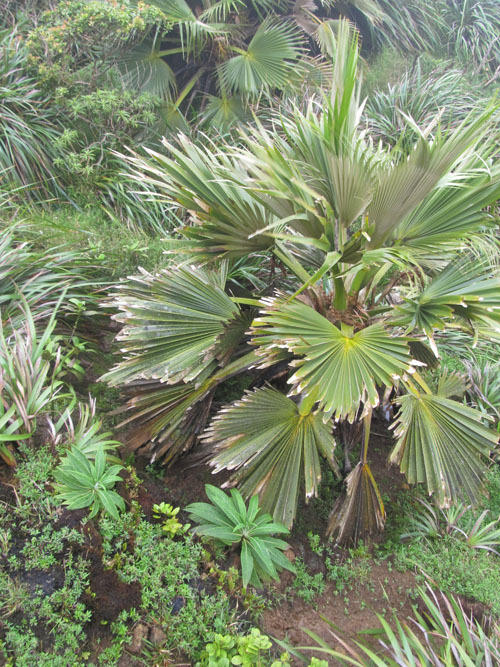 When we turned right on the Koolau summit ridge and descended ʻAwaʻawaloa we saw Lobelia oahuensis growing next to a loulu palm (Pritchardia martii). 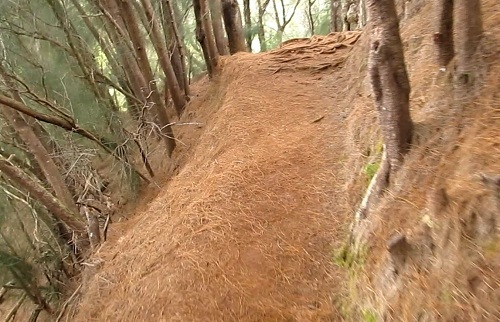 The spine was mostly wide open but several sections were overgrown — so we cut back the vegetation that blocked the way. 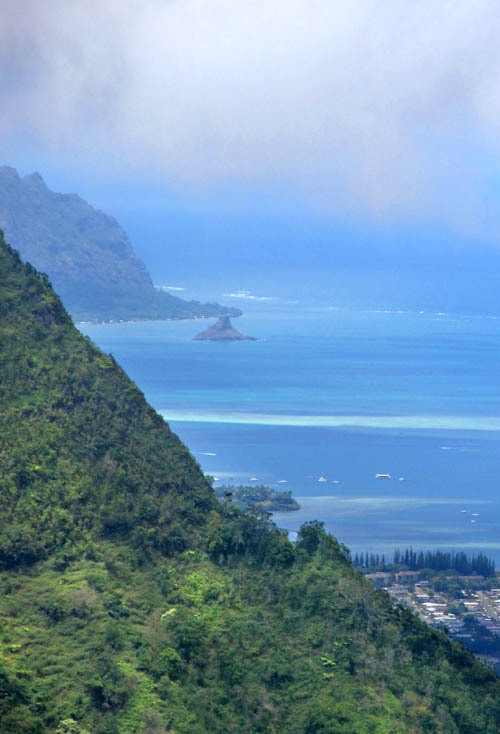 The clouds lifted temporarily and gave us fantastic views of windward Oʻahu. We enjoyed seeing see the offshore islet of Mokoliʻi in Kāneʻohe Bay off in the distance. 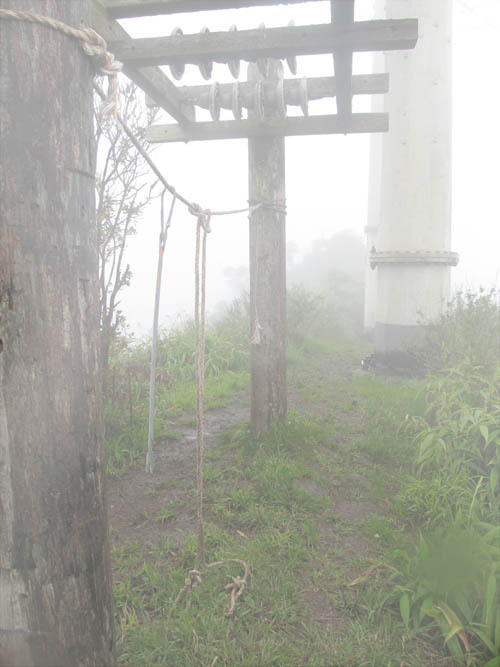 But as we made our way towards Kaʻau Crater the clouds inevitably returned — first starting out as a gentle mist but becoming a thick fog. The clouds were so thick when we reached the western edge of Kaʻau Crater that we could only tell we were there from the electrical towers that transport electricity to the windward side of the island. 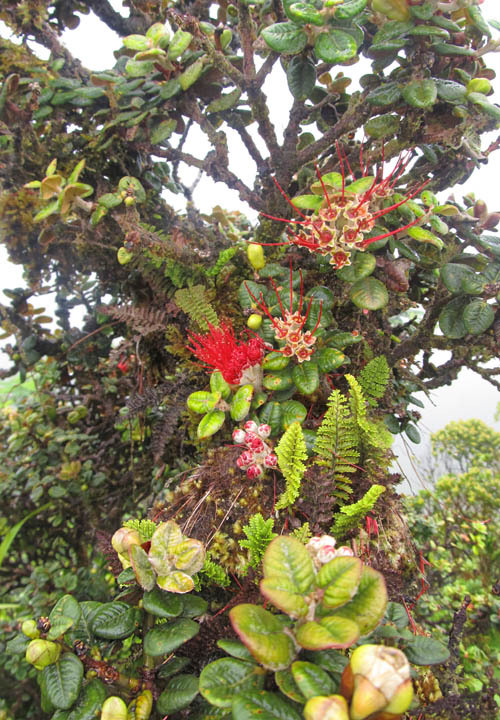 When we reached the eastern edge of the crater we saw the red flowers of lehua papa (Metrosideros rugosa). It was interesting to see the flowers and leaves of this ʻōhiʻa in all stages of development — from bud to maturity and beyond. 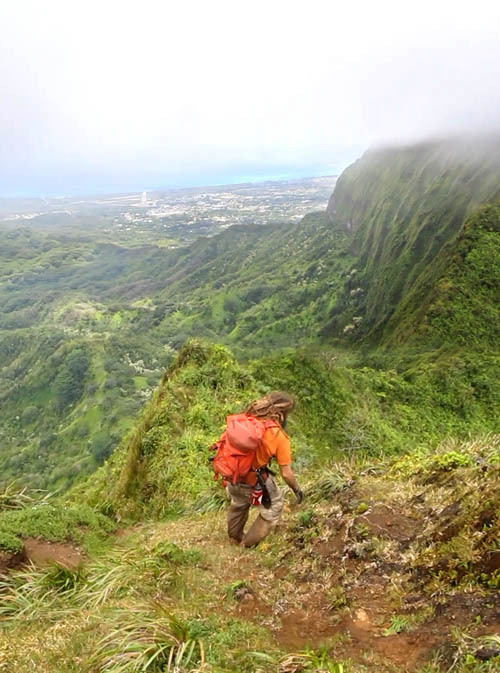 Rain clouds dropped their moisture several times as we made our way along the spine of the Koʻolau. Fortunately, the rain did not last long and we continued onwards. 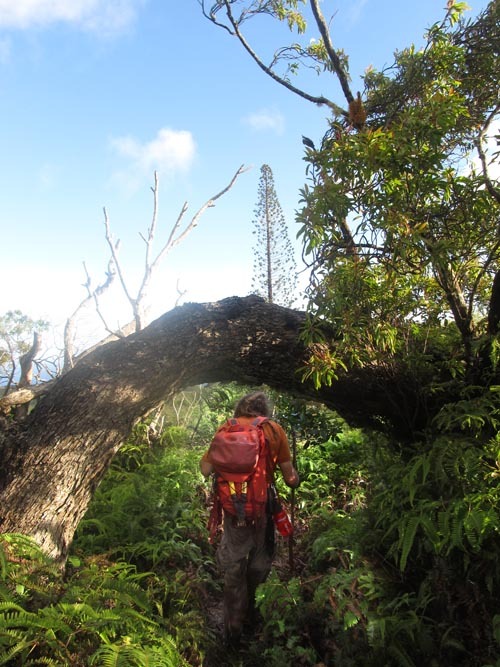 While making our way over the last section to our goal — Kaʻinawaʻaunui — the leaves of lapalapa trees (Cheirodendron trigynum) fluttered in the breeze. 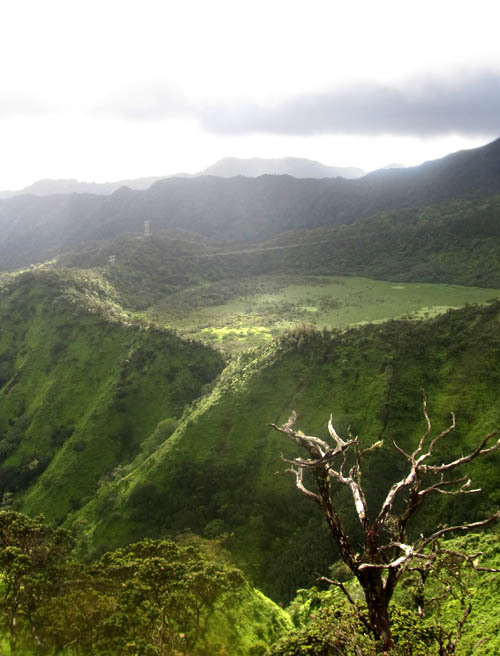 When we reached Kaʻinawaʻaunui — the summit of the Lanipo Trail — we turned off the Koʻolau summit ridge to descend Mauʻumae Ridge. As we made our way down, the clouds lifted and we could see Kaʻau Crater and the crack on the east side into which a series of waterfalls cascade. 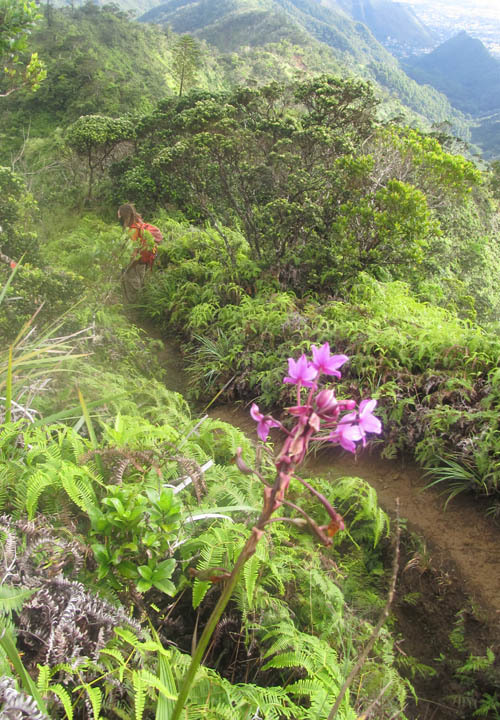 We saw a number of Philippine ground orchids (Spathoglottis plicata) in bloom with attractive purple flowers as we made our way down the trail. 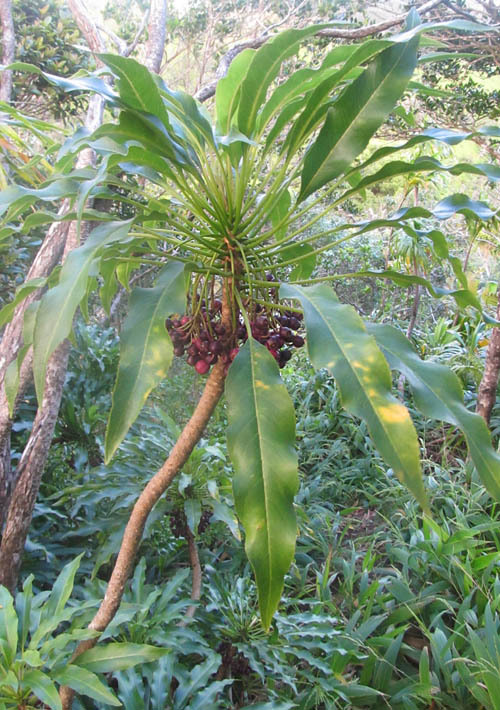 We veered off the main trail to visit a patch of haha (Cyanea angustifolia) which August stumbled on several years back. 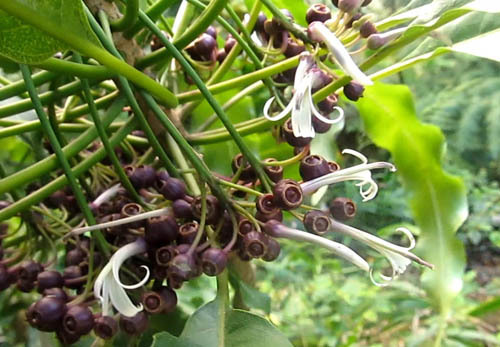 Although this endemic lobelia is not on the list of endangered species it is quite rare — especially on the leeward ridges of East Honolulu. We were thrilled to see to several small white flowers about an inch-and-half long on a few of the plants. It was good to see so many clusters of fruit on the plants — a good omen for the future. While making our way along the cook island pines trees that dot the Mauʻumae Ridge, we ducked under a koa arch next to an ʻiliahi tree. The final leg our hike was down the rocky saddle and back up to the trail head at the top of Maunalani Heights. While making our way to our cars, I reflected on the great time we had hiking in the clouds from ʻAwaʻawaloa and Kaʻinawaʻaunui, seeing cool and unusual plants and animals, and admiring the views along the way. What a great hike! Wicked cool. Love the pictures!!!! 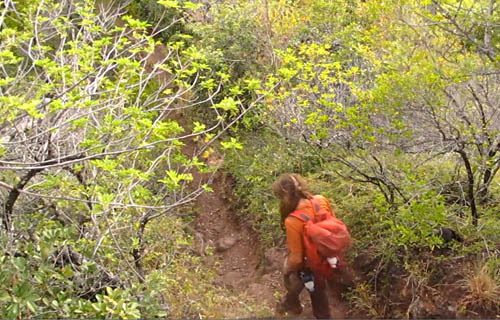 Spectacular pictures and video of a great hike! I have been on parts of it and now I will have a greater knowledge of what I see there. Thanks Nathan!